I have posted Problem set 4 on the course website. This problem set is based upon the “Properties of Stock Options” reading, and it consists of four problems. It is due at the beginning of class on Tuesday, February 12. Once you have input these data, select the call button for the call option price and the put button for the put option price. 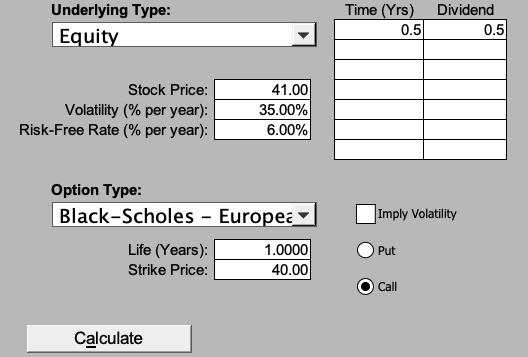 Depending on whether you select “Put” or “Call”, when you click on “Calculate”, the spreadsheet will report back put and call option prices based on the Black-Scholes-Merton (BSM) option pricing formula. For now, this formula may be somewhat of a black box for many (if not most) of you, which is a “problem” we will surely rectify in the not-too-distant future in Finance 4366.